26, of Glenburn, Maine; assigned to the 1st Battalion, 12th Cavalry Regiment, 3rd Brigade Combat Team, 1st Cavalry Division, Fort Hood, Texas; died Feb. 9 in Baqubah, Iraq, of wounds suffered from an explosion during breaching operations. Also killed were Spc. Leeroy A. Camacho and Staff Sgt. Alan W. Shaw. Eric doesn’t yet have a stone representing his spirit, his life and his memory. However, it was my privilege to share some stories of his life with my teammates during a recent GORUCK challenge I participated in. On June 5th and June 6th, 2015 I was part of an amazing team of people taking part in a GORUCK Challenge; Class #1500. As part of every GORUCK event, the class is required to carry a team weight of their choosing which has to meet a minimum weight standard. During this particular event, our class chose to incorporate stones from The Summit Project. Having never heard of The Summit Project, it was quite emotional learning about the purpose of the group and, even more so, learning about some of the many soldiers whose lives have been lost. It then dawned on me that my brother-in-law had a son who would likely be a part of the project; Army Staff Sgt. Eric Ross of Glenburn, ME. Although Eric doesn’t have a stone yet, I reached out to my niece, Deidre, to learn a bit about her brother. Story after story told of his love of God and his love for his wife, Allison, and kids, Trevor, Megan and Gabriel (who Eric never had the joy of meeting)! He enjoyed the outdoors including hunting and fishing and cheered on the New England Patriots. He cared a lot about his platoon and their safety and making sure they came home from Iraq. He was an outstanding shot and his fellow soldiers described him as funny, a quick thinker, intelligent and a great friend who had an ability to put everyone at ease. Staff Sgt. Eric Ross, who was only 26 years old, was in his second tour of duty in Iraq. He was killed on February 9th, 2007 during combat operations in Baqubah, a city northeast of Baghdad in Iraq’s Sunni Triangle. He was assigned to 1st Battalion, 12 Cavalry Regiment, 3rd Brigade Combat Team, 1st Cavalry Division based at Fort Hood, Texas. The day Eric was killed, the plan was supposed to follow protocol: the Iraqi forces being trained by the Americans were to enter the building first, followed by U.S. troops. However, this time, the Iraqis refused to go. Eric’s squad entered the building, but it was booby-trapped. A bomb went off and three U.S. soldiers were killed: Eric, Spc. Leeroy A. Camacho and Staff Sgt. Alan W. Shaw. During the GORUCK Challenge, which lasted a little over 14 hours, I thought of Eric often! Conversations with fellow teammates seemed to naturally go hand-in-hand with conversations Eric might have had with his squad. Talk of sports, the outdoors and especially family were topics shared amongst ourselves. Like Eric, I would crack a joke or act a little goofy if it could get someone to laugh or smile; especially while struggling or suffering during the event. At one point during the challenge it was my responsibility to be the leader of our class. Again, my thoughts went to Eric. As he would have to have done, it was my task to get the group to complete certain undertakings told to me by our event leader, Cadre Daniel. Our GORUCK Challenge started at 9pm. I’m guessing it was approximately ten hours into the event (we were never supposed to know what time it was, but the sun was rising and people were starting to come out of their homes) when we stopped to honor the soldiers whose stones had been carried along the way. It was amazing, heartwarming and heart breaking all at the same time. After all of the represented Summit Stone carriers shared the stories of the other soldiers, I was able to share a bit of Eric’s life with the group. To say it was my honor is an understatement! What a great way to honor his life and service. One of many reasons we so love and respect you dear girl. Today I had the honor of carrying the stones of two fallen heroes for the Summit Project: Army SSG Eric Ross from my town, Glenburn ME, and Capt Christopher Sullivan of Princeton, MA. When I went to the MEPS office to pick up a memorial stone, the gentleman there said, “This is Eric’s stone. It’s new and hasn’t been hiked with yet.” I looked at his information and saw that he loved hunting and fishing just like I do and I knew it was the stone I was meant to carry this weekend. Christopher’s stone was next to Eric’s and I couldn’t leave it behind so both accompanied me up Borestone Mountain. It was an incredibly beautiful day and I felt privileged to be carrying the stones to honor their memory. As I thought about all they gave for this country, I hoped I could live a life worthy of their sacrifice. I carried their stones for a hike but will carry their stories for a lifetime. I learned so much about Eric and Christopher’s service and sacrifice for our country. On July 6, 2017 I was honored to carry Eric’s stone to the top of Cadillac Mountain in Acadia National Park. I was hiking with a group of women who came together to remember our fallen heroes. We placed our stones in our backpacks and attached American flags to our bags. I asked to carry Eric’s stone because I have lived in Glenburn and worked at Glenburn School for over 25 years. Although Eric did not attend our school, his siblings did. In addition, Eric attended Orono High School where my husband taught. I wanted to carry his stone to honor his family, friends and community. Like soldiers meeting new company members, I met new friends on this hike. All of us were women who worked with children in one capacity or another. We are all mothers and felt the burden of knowing a mother grieves for her lost child. As we hiked across the South Ridge of Cadillac Mountain we came across a puddle that was drying out in the shape of a heart. A poignant moment for us all. I also thought of Eric’s children who have grown into teenagers without their father. A difficult task in today’s world. When we reached the summit, we each took our stones from our packs and made a circle with the stones. We each shared our soldier’s story and reflected on the sacrifices they gave to serve our country and to help bring peace to our world. Less than a week later, I found myself summiting Mt. Katahdin in Baxter State Park for the first time. With winds of 40-45 mph at the peak it was a challenging hike for me. Although I was not carrying Eric’s stone with me at the time, he was in my thoughts as I struggled to make it over the Table Land to the top. I thought of all the hardships he endured in Iraq and the loss his family must feel. Thank you for allowing me this honor. A stone, chosen from the hope of a young man for his wife and 3 children to find new life, new purpose and a new family if the unthinkable should ever happen while he, SSG Eric Ross, Army, 26 of Glenburn, Maine was serving his country, his family, our flag and all it stands for, in another country called Iraq in 2007. I was given the honor of carrying this young man’s stone and a part of his story to the summit of Cadillac Mt. on a balmy fall morning in October. Our team took the Northridge trail. This was my first hike with the Summit Project honoring Maine Fallen Heroes. I became involved with the Summit Project last year while attending the 2016 Run for Maine’s Fallen. There I saw the display table of stones and met the bright eyes and smiles of Dave Cote and Angel Matson and witnessed their burning heartfelt honor for each stone represented and those stones not yet chosen. It was there they told me about these stones and that I could find one to represent my son, Derek Winn Russell, USCG. And this is where the intertwining story of Derek and Eric begins. I’ve read about Eric’s prankster ways. Derek was too. They most certainly have found each other by now! I‘ve heard from others at different events that you don’t choose the stone, it chooses you. We may have experienced their antics recently. But that is a story for another day. I will say Eric’s wife, Alison, and I both dropped our newly chosen stones off to be taken to the engravers at the same meeting place one day in the spring. That in itself was an emotional moment, letting go of the stones we both had chosen, like letting go again as they both went off to serve in their respective branches of service, Army and Coast Guard. Not only about the love Eric Ross had for his brothers in arms as he attended to the detail of their protection and safety and kept that ever in the forefront of his mind at all times even to the last, But also about the love he has for those most dear. This is just one story of how Eric loved his wife and children and his concern and care for them did not stop in 2007. Alison shared with me that she had gone to Texas after graduating high school and a friend she made there said ‘oh I know someone from Maine”. The stone was chosen from the earth where they rebuilt, “starting fresh and rising from the ashes like Eric wanted.” She also told me she knows Eric is happy for them all in their new home and big mixed family. On September 29, 2018 my son Colby (9 years old) and I had the honor and privilege of hiking the stories and the stones of Army Staff Sergeant Eric Ross and Army Sergeant Lynn R. Poulin Sr. It was our third Summit Project (TSP) Hike in Acadia National Park and sixth TSP event. This year was a unique as the first one. Colby and I received our stone assignment at the end of August; Colby had SSGT Ross and I had Sgt. Poulin. Upon assignment we began researching our heroes, both of us eager to learn about and honor another Maine hero and prepare for a hike with our TSP family. SSgt. Ross, from Glenburn and assigned to the 1st Battalion, 12th Calvary Regiment, 3rd Brigade Combat Team 1st Calvary Division in Fort Hood Texas, died on February 9th 2007 at the age of 26 while serving his second tour in Iraq. He was killed while conducting an operation in Iraq in which he entered a boobytrapped building tripping a bomb. SSgt. Ross was married with two children and a third on the way. As in past years, I had to explain to Colby what certain terms and phrases meant that he had read while he was researching his hero. We made sure that we mentioned our hero at least once per day in the weeks leading up to the hike so it’s not just the one day that we are paying tribute, but it’s the time before and after making their memories eternal. Sgt. Poulin of Freedom, Maine was part of the 133rd Engineer Battalion in the Maine National Guard in Belfast. He was killed at the age of 47 on December 21, 2004 during an attack on a dining facility that he was in. 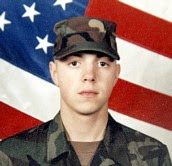 Twenty-two other soldiers also died in the attack to include another Maine Hero, Army Specialist Thomas Dostie. Sgt. Poulin worked at Bath Iron Works and was known for his phenomenal skill, and ability to always smile. On the morning of the hike, Colby and I drove to Smugglers Den Campground where we met with our TSP family. We saw the stones belonging to our fallen heroes and collected them with their story cards. During the collection of the stones we observed stories and stones that we had carried and had connections to in the past; reminiscing on those events and talking about small details that we remembered about their lives. We attended the hike brief and were informed that the following day was Gold Star Family Day. We looked around the tent and observed all the Gold Star Families members, giving us a reminder as to why we were on the hike and what TSP stood for. We began the trek up Acadia Mountain. The hike portion is always solemn for Colby and me as we love the outdoors, but we want to remember our heroes during it. We instill in each other that if it were not for heroes like the ones we were carrying, we would not have the pleasure to enjoy the outdoors not only on the hike day, but on any day. As we crested the summit, we prepared one another for the circle ceremony to solidify our thoughts about our heroes and how we will present their stories to the members of our team. We went around the circle sharing the stories, giving thanks and celebrating their lives. Following the ceremony, we met with girl scouts on the mountain who were there to support TSP and any members of the public who had questions as to what TSP is all about. We then descended back to Smugglers Den where we met again with all the Gold Star Families and the TSP base camp team. We shared a meal and stories with one another forming new bonds; all of which are because of the sacrifices the Maine heroes have made. TSP is not about one day. It is about friends, relationships, and memories of our heroes 365 days a year. Colby and I were fortunate to hike with a wonderful TSP team and hope to continue to do so in years to come.